A simple schematic diagram illustrates the diverse ways mapmakers and governments define the coastline and its related maritime boundaries. A horizontal line represents the water surface, and an uneven line sloping downward to the left represents solid ground. The lines intersect at a point labeled MHT, meaning mean high tide, and a pattern of closely spaced diagonal lines representing water depicts the transition from shallow to deep water and the comparatively abrupt drop between the continental shelf and the deeper ocean beyond. Above the MHT shoreline the land rises beyond a point described as the “Landward Limits of Which Adverse Impacts May Be Generated”—quite a mouthful—to a mythical hill labeled Inland Limit of Climatic Influence. I say mythical not to mock evidence for climate change, which will surely have adverse impacts and a wide influence. So-called skeptics perversely deny a clear link between increasing atmospheric concentrations of carbon dioxide and other greenhouse gasses and long-term upward trends in global temperature. The history of science is a thick stew of contested claims, and the skeptics were sometimes right. But not this time, I think: though specific predictions of sea-level rise and extreme weather are fraught with uncertainty—in the same way that science cannot predict the day or even the year of a major earthquake, no one can forecast when sea level will exceed its current position by another 10 meters. Even so, simple radiation physics and a convincing archive of climate data warn of an inevitable invasion of coastal lands, with dire consequences for low-lying nations like Bangladesh and the Maldives. Unless, of course, a succession of volcanic eruptions like Mount Pinatubo in 1991 can stem the tide. But don’t count on it. In a recent book on coastal mapping—Coast Lines [two words, deliberately]: How Mapmakers Frame the World and Chart Environmental Change (University of Chicago Press, 2008)—I described four distinct types of coastal boundary. My first coastline is mean high tide (MHT), the land-water boundary charted by explorers like Columbus, who mapped the coast from a distance, on their ships, and the second is mean low tide (MLT), of considerable importance to sailors, ever fearful of running aground. This second coastline is the reference level used on marine charts to portray bathymetry, that is, the depth of water. My third coastline is the storm-surge line, representing inundation from a severe coastal storm or tsunami. Engineers who study meteorological hazards use computer simulation models to estimate the approximate position of this hypothetical third coastline; their models rely upon plausible storm tracks derived from a climatological database and digital representations of surface and submerged topography. By contrast, modeling “run-up” from a tsunami is complicated by the need to consider slippage along nearby underwater faults as well as massive submarine earthquakes thousands of miles away. Charting the first two coastlines depends upon careful measurement of tides, which reflect the gravitational pull of both sun and moon as well as the funneling effects of undersea topography, epitomized by the Bay of Fundy, where the difference between low and high tide can exceed fifty feet. Although most coastal locations experience a twice-daily rise and fall in water level, one of the two low tides is often appreciably lower than the other, which makes mean lower-low water (MLLW, not shown in the graph) a more reliable reference for bathymetric contour lines than mean low water (MLW). This difference between two successive low tides is particularly pronounced in the vast Pacific Ocean, where the sun and moon have a much larger mass of water to tug back and forth. Shoreline elevations established at tidal stations, where a long period of record yields a reliable mean, can be extrapolated along a broader stretch of coast using carefully timed aerial photography. Periodic adjustments of the tidal datum are needed because of global sea-level rise as well as coastal emergence or subsidence caused by geologic forces. The diagram also shows several geopolitical and regulatory boundaries anchored to a charted shoreline. The territorial sea once extended a mere three miles from the shore—allegedly the maximum reach of a cannon on the shore—but nowadays most (but not all) nations claim sovereignty over waters within 12 miles of their low-water shoreline. By international agreement every nation also has jurisdiction over seabed mining and fishing within its exclusive economic zone (EEZ), typically 200 nautical miles across but wider where the continental shelf is relatively broad. The rule that lets a tiny island command a proportionately vast EEZ also established an international boundary between the United States, which owns American Samoa, and New Zealand, which administers Tokelau. 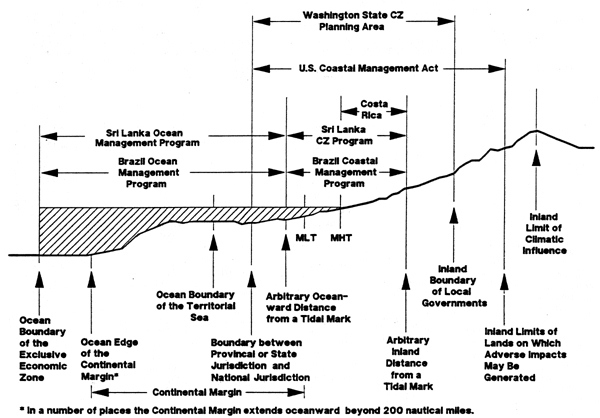 The diagram includes a few examples of international variation in the coastal management zone used to protect coastal marshes and other near-shore environments. Not shown are state-to-state variations in the coastal boundary between public and private land, which can guarantee or restrict public access to the beach. 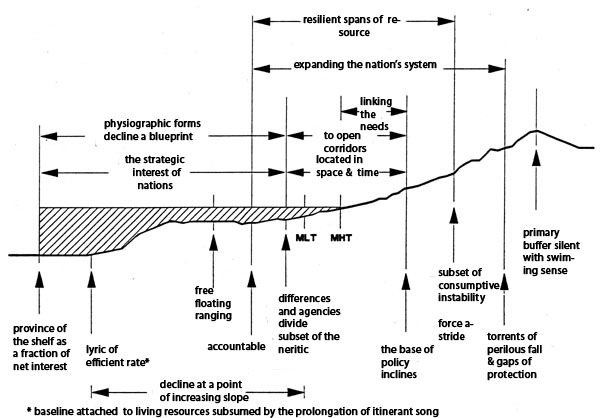 As an aficionado of statistical graphics, I am impressed by this simple schematic’s ability to summarize the diverse ways maps can aid navigators, extend sovereignty seaward, protect fragile environments, and underscore the hazards of living near the shore. 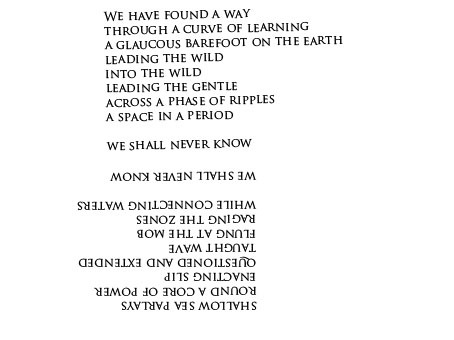 MARK DICKINSON: ‘Zones By Scarce Intersect’ and diagram, below.